Today, organizations of all kinds are ruled by the belief that the path to success is quantifying human performance, publicizing the results, and dividing up the rewards based on the numbers. But in our zeal to instill the evaluation process with scientific rigor, we've gone from measuring performance to fixating on measuring itself'and this tyranny of metrics now threatens the quality of our organizations and lives. In this brief, accessible, and powerful book, Jerry Muller uncovers the damage metrics is causing and shows how we can begin to fix the problem. Filled with examples from business, medicine, education, government, and other fields, the book explains why paying for measured performance doesn't work, why surgical scorecards may increase deaths, and much more. But the book also shows that, when used as a complement to judgment based on personal experience, metrics can be beneficial, and it includes an invaluable checklist of when and how to use them. The result is an essential corrective to a harmful trend that increasingly affects us all. Pre-order The Tyranny of Metrics for your Kindle today. I've long harboured doubts about the metric mania, but it's all laid out in a new book, The Tyranny of Metrics, by Jerry Muller. Muller says we've been gripped by metric fixation which is the seemingly irresistible pressure to measure performance, to publicise it, and to reward it, often in the face of evidence that this just doesn't work very well. 5.0 out of 5 starsIf this fails to convince you, nothing will. For the first time, someone has done the due diligence of researching the facts about measuring human performance. And that someone is probably the right person to do it. 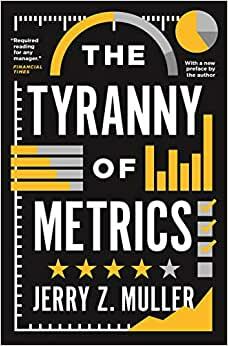 Without bias or any personal agenda, history professor Jerry Z Muller provides the most comprehensive, thoroughly researched, illustrative and evidence-based argument against using metrics, KPIs or performance measures to reward, punish or "performance manage" people in any sector or industry. As a specialist in performance measurement, this book is music to my ears. Muller suggests the alternative: measure only what matters, measure it meaningfully, with buy-in, encouraging collaboration, and for the purpose of continual improvement. I was not surprised by historian Jerry Z. Muller's comments about "metric fixation" in his illuminating new book, The Tyranny of Metrics. Some years ago the chairman and CEO of a Fortune 500 company remarked to me that nobody, not even Jack Welch, the then-idolized leader of General Electric, could possibly turn in solid revenue and profit increases steadily, quarter-after-quarter, year-after-year, through ups and downs in the market. It was clear to him that somebody was cooking the books at GE. I had been in business long enough then to understand how easy it is to shift sales and revenue from one quarter or year to the next and how other steps could be taken to fudge the numbers. (I was also aware of Welch's reputation as "Neutron Jack" for his ruthless practice of "downsizing" to increase profits, a practice that can also be timed to give the appearance of steadily increasing profits.) It had been clear to me for many years that numbers can lie. In his new book, Muller tackles our society's obsession with metrics and accountability. However, "[t]his book is not about the evils of measuring," he writes. "It is about the unintended consequences of trying to substitute standardized measures of performance for personal judgment based on experience. The problem is not measurement, but excessive measurement and inappropriate measurement—not metrics but metric fixation." In just 200 pages, Muller assesses the use and misuse of metrics through case studies drawn from a wide range of fields: colleges and universities, K-12 education, medicine, policing, the military, business and finance, and philanthropy and foreign aid. The research he cites, and the examples he chooses, are compelling. I've had my own intimate experience with the misuse of metrics in both philanthropy and foreign aid. More than thirty years ago, when I was running a consulting agency that raised money for nonprofit organizations, I wrote and spoke to whoever would listen about the absurdity of measuring nonprofit performance on the basis of its fundraising costs. Years later, when I became involved in consulting with NGOs in developing countries, I saw for myself the folly of the metrics obsession that had seized hold of the international development community after Bill Gates began proselytizing on the subject. That fixation on the numbers forced far too many charities and government agencies to funnel money toward easily measured but trivial or even irrelevant programs while ignoring others that might actually have some positive impact in the field. Muller sums up the problem nicely. "There are things that can be measured. There are things that are worth measuring. But what can be measured is not always what is worth measuring; what gets measured may have no relationship to what we really want to know. The costs of measuring may be greater than the benefits. The things that get measured may draw effort away from the things we really care about. And measurement may provide us with distorted knowledge—knowledge that seems solid but is actually deceptive." Amen. Some of the examples Muller cites are familiar to the public at large. "Teaching to the test," for example. The tendency of some surgeons to decline to operate in difficult cases because failure would lower their success ratios. And the tendency of police under pressure from politicians to make the numbers look better by classifying felonies as misdemeanors or altogether refusing to write up crimes. These are just a few of the many sad ways that our obsession with accountability distorts our understanding of the world around us. ** Forcing employees to spend time logging data instead of doing their jobs (a requirement that was a major factor in convincing my brother to close his psychiatric practice many years ago). Muller concludes The Tyranny of Metrics with a useful checklist of ten questions that any manager should ask when considering the application of metrics at work. One of my favorite books of all time is Theodore Porter's "Trust in Numbers" Trust in Numbers. It provided an in-depth look at how numbers are constructed, i.e., they are cultural artifacts. Thus when I ran across "The Tyranny of Metrics" being reviewed in "Science" by Theodore Porter, I took note. Jerry Muller has written a very useful book, one that should give pause to anyone who would mindlessly use, or construct, a metric of a performance. There is a lot worth noticing in this book, but I was especially impressed by his discussions of how people can (and will) "game" a metric when it is used to measure performance and determine compensation. This more or less falls out of his distinctions between "intrinsic" and "extrinsic" motivation, and "internal" and "external" users of metrics. In the context of these distinctions, we learn that metrics are especially problematic when used for extrinsic (compensation) purposes by external users, but metrics can be quite valuable when used for intrinsic purposes by an internal user, i.e., for professional development. This is one of those books that would benefit from a second read to more fully explore its implicit analytical structure. Happily, it is short enough, and engaging enough, to make this an prospect attractive. I live with this invasion of tyranny in academia. I am too far along for it to affect me, but I can see that its impact on our great universities might save money, but it is really not in our national interest. An academic department has to have a diversity of individual specialties. Not all fit the same type of metrics, but brainless managers that belong somewhere else do not seem to understand this. We used to say deans cannot read they can only count and some can only count money. Universities have to pay their way, but metrics are not always a substitute for experience solid management that takes into account all aspects of the story. Professors are not stupid. They can quickly learn how to game the system. So can their managers. None of this nonsense makes us better, just cleverer. I didn’t dislike this book, more that it didn’t meet my personal needs. This is a very general overview of the trend to quantify things, and the author uses examples of well-known research and history to back up the idea that some things shouldn’t be quantified, some metrics are misleading through deliberate misuse, and overall, there’s an air of false certainty surrounding many simplified metrics. If you’re already familiar with histories of economics, management and industrial theory you probably won’t find this book that insightful. For a quick general overview for a reader new to measurement and management/economic theory, it’s an easy read that you might find interesting. My only negative comment is that the book probably should have been 30 pages shorter; the key points could be made in much less space without losing the key thesis.